Savor the experience of Central Europe’s gems along the Rhine, Moselle, Main, and Danube Rivers, and begin your European vacation with a wonderful visit to Paris. See the sights with an expert guide, drive past the Latin Quarter, Les Invalides, Place de la Concorde, Eiffel Tower, the Arc de Triomphe and enjoy a Seine river cruise. Your Monograms vacation package includes 2 nights in Paris, VIP sightseeing, and helpful onsite support from your expert Local Host®. 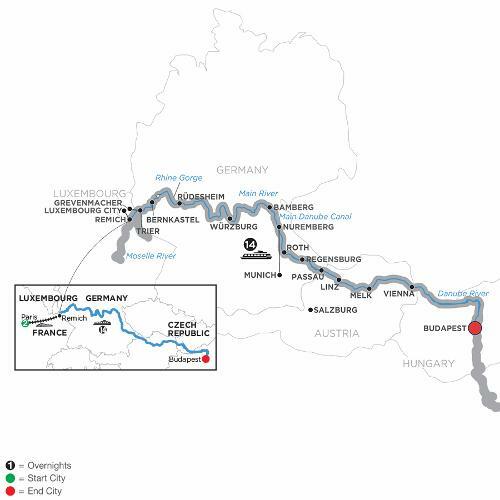 After your stay in Paris, take a high-speed train from Paris to Luxembourg City to board your Avalon Suite Ship® in Remich on the beautiful Moselle River. First stop on your European river cruise is Trier, Germany, believed to be even older than Rome and many remnants can still be found, such as imperial baths. The wine village of Bernkastel will fascinate you with its narrow streets and half-timbered houses still standing from the Middle Ages. Continue your European river cruise through the dramatic Rhine Gorge, considered the most beautiful stretch of the Rhine River. See the rock of the Lorelei and ancient castles standing majestically on cliffs 400 feet above the water. Visit the magnificent Bishop’s Residenz in Würzburg and marvel at medieval Bamberg, a UNESCO World Heritage Site. Enjoy a guided visit of historic Nuremberg and an excursion to Bavaria’s capital, Munich. Along the Danube River is Regensburg, Germany, one of Europe’s best preserved medieval cities, where you can taste some of Germany’s famous beers! Visit Passau with its narrow, winding cobblestone streets, and Melk’s magnificent 11th-century Benedictine Abbey, before arriving in Vienna, the “City of Music” that inspired the genius of Beethoven, Mozart, and Strauss.